CD1 - 19 tracks: Festival Lights * Portnahaven * All Over This Town * Fires of Edinburgh * Applecross Bay * Slow French Waltz * American Accent * The Bonny Maid of Fife * Middle-Aged Men * Envy The Wind * It’s a Lie * The Seige * On This Island * Mephistopheles on Minto Street * Cold Night in This Old Town * Borderland * Sorrowlessfield * Running Home * Here’s To You. CD2 - 18 tracks: Corryvreckan Calling * East Lothian Sky * Far Down The Line * Nowhere Else To Go * The Beatles Played Kirkcaldy / Happy To Dance With You * Crooked Smile * Song of The Plough * The Heron * Ainster Harbour * Everybody Lies * The Heart * Loves The Rising Sun * The Field Behind Our House * White Horses * Norman’s Dram * The Daybreak Carol * Long Road * Take My Time. 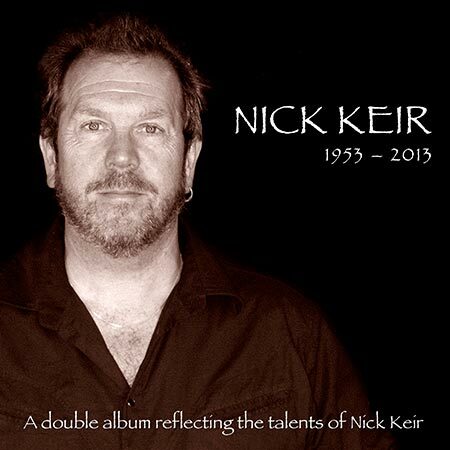 A double album reflecting the talents of Nick Keir. Nick Keir formed the group Finn McCuill while at Stirling University, then toured with poet Norman McCaig, worked with the 7:84 Theatre Company and in 1982 he joined The McCalmans. He remained with the group for the next 30 years and toured all over the world as one of the best known and most successful Scottish traditional acts. Many of his own songs entered the repertoire of The McCalmans but at the same time, Nick made many solo appearances, including his annual Edinburgh Festival Fringe gigs and still found time to record four solo albums. In 2004 The McCalmans were inducted into the Scottish Traditional Music Hall of Fame and were presented with a Lifetime Achievement Award. When The McCalmans retired in 2010, Nick joined Stephen Quigg and toured successfully across Europe. He was particularly proud of having joined the Tolkien Ensemble, a group of Danish-based musicians, presenting a musical spectacular based on The Lord of The Rings, with Sir Christopher Lee as narrator. Nick was also the lead in a production of The Hobbit with the same ensemble. There was further collaboration with the Holbaek Ensemble of Denmark, playing a mix of Scots and Irish traditional music laced with the Baroque of Corelli and Vivaldi. The thirty-seven tracks on this tribute double CD collection were selected mainly from Nick’s four solo albums: Rumours Of Snow, All Over This Town, Fishing Up The Moon and The Edge Of Night, plus tracks featuring Nick’s songs from most of The McCalmans’ albums from 1982 onwards. All songs in the collection were written by Nick, except Envy The Wind by Lucinda Williams, which Nick always included in his solo gigs. This is a truly remarkable collection by any standard. Double CD for the price of a single CD.